I don’t have a lot of small gang lowsec PVP experience and in order to broaden my experience level, I like to enlist other people to show me the ropes. Sunday night I went on a 2 person Thrasher roam with JonnyPew of the Explorer’s Log Youtube series. We ended up deciding on Thrashers since they are a versatile and throwaway PVP ship. I really want a “Copy Ship Fit” option that will take the existing ship’s fit and assemble a duplicate in the same hangar. I only had to fit up 10 Thrashers and I was already getting annoyed. I found that if I put all the modules, ammo, and rigs in to a container and dragged out of that, it helped the mass fit process. I can’t imagine what the RVB people go through to fit up waves of disposable Rifters. 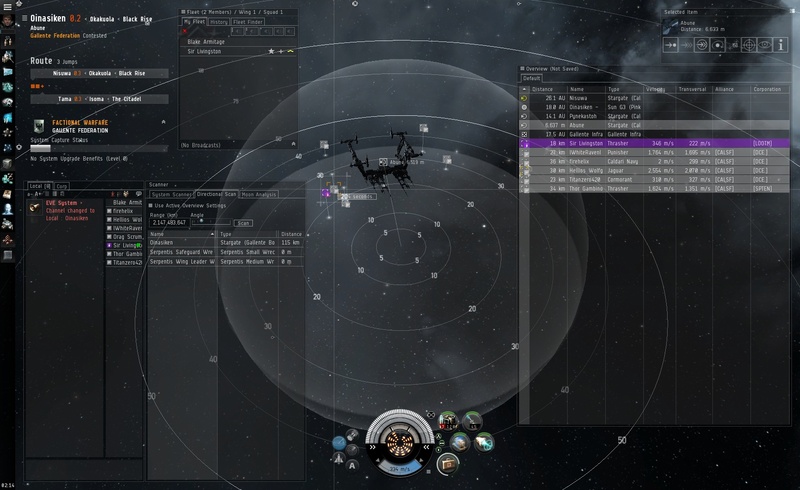 We started in Jita and made our way through Black Rise to Tama under JonnyPew’s guidance. If you don’t know, Tama is a well known PVP lowsec spot so we wanted to end the night there. 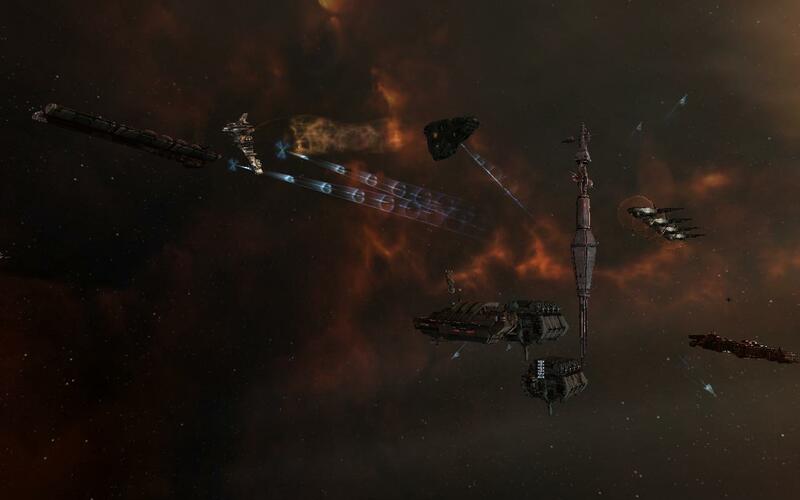 On our way to Tama from Jita, we played standoff with a frigate gang and tried to bait a few Faction Warfare people running sites. 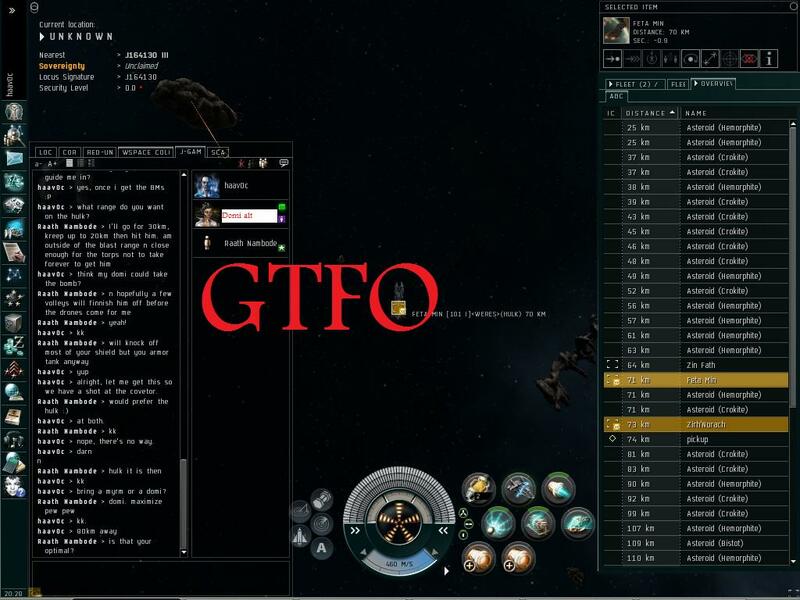 We ended up not engaging anyone and instead ganked a cyno alt that was waiting out a beacon. Too many times have I been on the receiving end of this action so it was nice to be the one shooting slugs into a helpless ship. When we got into Tama, we found a solo Thrasher and attempted to bait it. It turns out that my AutoCannon fit was no match for the Artillery off-grid boosted Thrasher. Our bait went successfully as I warped off to a clearly discernible planet at 30 after locating the solo Thrasher. He landed at 0 on the planet, 30k away, and locked me up. To my amazement he was getting hits on me from 20k away and as I voiced my amazement, JonnyPew informed me that he was most likely Artillery fit. My 1,100 optimal was no match and I went down in under 30 seconds. At least I got a ‘gf’ in local. Sunday night US (1:00 Monday UTC) seems to be a good block of free time for me. I might try to make this Sunday night suicide roam a regular occurrence. If you are interested in FC’ing or tagging along, contact Blake Armitage in game. Skype conference seems to be the easiest way to communicate for me until I setup an official voice server. Don’t worry, I’m not disillusioned, but I wanted to highlight a recent topic on reddit.com/r/eve called Disillusioned at EVE. Can we talk, /r/EVE? If you haven’t been exposed to the r/eve or r/evedreddit you should spend some time reading over the content. The discourse is far more productive and insightful than the pitchfork wielding masses on the Eveonline.com Forums. I have lived in highsec, wormhole space, and now I’m making a home in nullsec. I’d like to reiterate the line that ‘Eve is what you make of it’. Right now I am finding solace in managing corporation financials. The poster talks about how large-scale nullsec warfare is a lot of warping around, blobbing, and hot dropping. I have no rebuttal to that as being involved in nullsec at the moment, this is what we do. From reading a lot of opinions over the months, I have come to the conclusion that the PVP experience in wormhole space is keeping a lot of people interested in the PVP aspect of the game. If you look at the numbers coming out of CCP, activity in wormhole space has been increasing since it was introduced. The mass limitations in the lower classes keep capital ships from traveling between spaces while higher classes limit the capital ships that can be brought for an engagement. The design of this mass mechanic is truly brilliant and it is what has kept the spark in veteran and newcomer PVP’ers alive. A few people have suggested to the poster that he should find an active WH Corp so perhaps he will go with that suggestion and find a new passion. Keep in mind that the two kills I’ve made are a myrm and shuttle, both of who were corpmates at the time that I accidentally either attacked with drones while assigning RR or was shooting at for giggles. So, standing at a proud 0% efficiency (I like to keep it above -1%), here’s some of the noticeable kills. In chronological order. My first loss eva, over two years ago. Did you know that rats sometimes fit warp scramblers? I didn’t. haav -> no, it’s not a pirate. haav -> it’s a rat. Nerf helios..es? heliosi? helios? One of those. The last time I tank a hauler instead of cargo or agility. Note to self: stop playing Eve when half asleep. 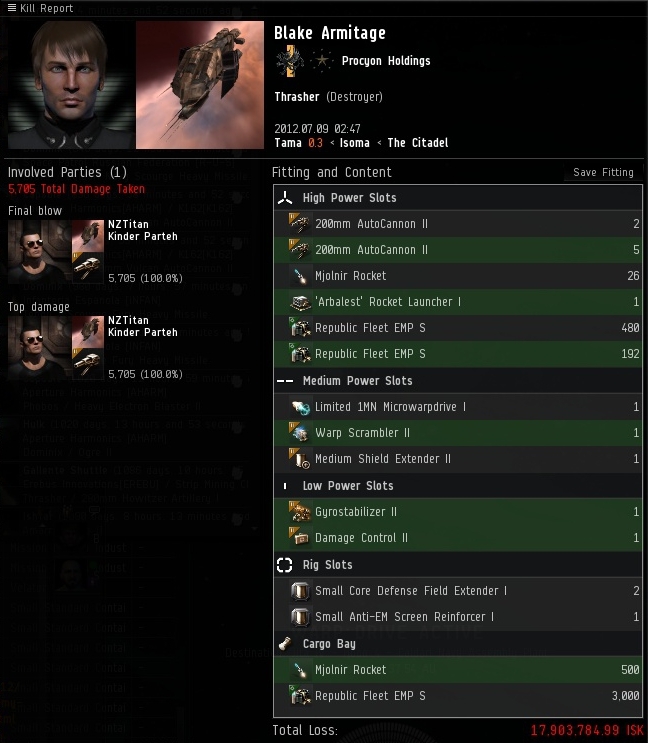 So, 0 isk in kills, about 1.3 bil in losses. Top that! And as a bonus argument: Does this make me a carebear? Not so recently, CCRES came into our wormhole, noticed an orca floating in the shields, killed all our defences and reinforced our tower in case we had forgotten to put strontium in a tower in a dread-accepting enviroment. The fact that they felt that the lack of strontium was a possibility makes me lose a little faith in the foresight of the Eve wormhole community. After the reinforced timer ended we repped the PoS in a rorqual, orca and a few BSs which got MUCH faster once we realized the ending of reinforced meant that we could access the cap rechargers, power relays and energy xfer arrays in the corp hangar. Size restrictions allow only battlecruiser hulls or smaller, but know that haulers, which can hold cap parts, large towers, fuel, x-large ship assembly arrays and everything else required to build a dread to kill your PoSes, can. Battleships are allowed in here, good for sites, bad when someone hates you, has a route to you and has a BS fleet handy can be a significant threat to your well-being. Build a carrier and rent/own/know someone who has a carrier pilot handy to scare off/murder/ambush attackers. Carriers are “allowed” to jump in here, hence you should be prepared. Don’t ask me how, we still haven’t come up with a a counter to a carrier/dread with support fleet. Essentially, the deeper you go, the more likley you are to be screwed, because the less time attackers have to invest in beating you into the ground. 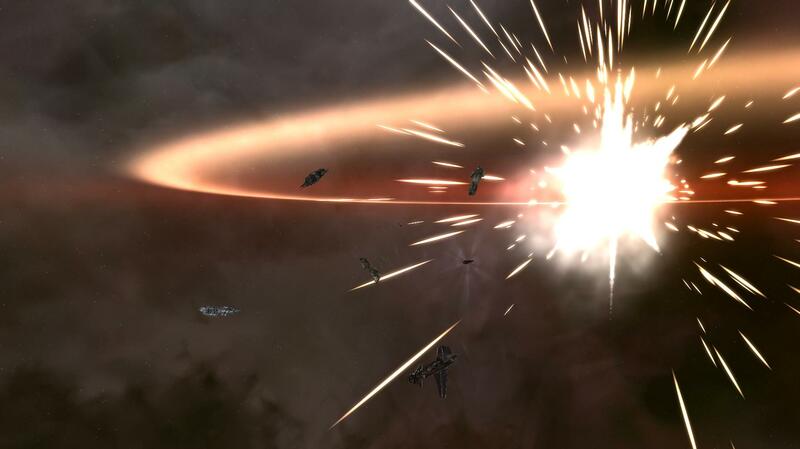 A battlecruiser takedown of a PoS is torture, a BS takedown isn’t much fun, and a dread-assisted takedown is about less than an hour, so an attacker’s time invested in making your life a living hell is much less than what it took for you to get two capitals, orcas, and the other thirty ships you’ve amassed over several months into the wormhole. The first and more reasonable method is to have several friends and/or piles of isk to hire several friends. 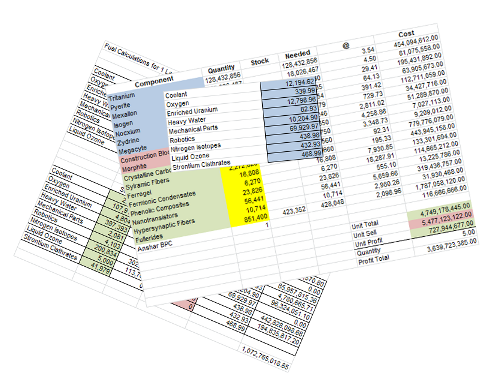 Eve is a spreadsheet game, but is refreshingly simple in combat calculations, which usually amount to “Whoever has the most experienced friends wins”. The method that, us lacking large groups of friends and a general sense of comradery, is to be ready to be gone. 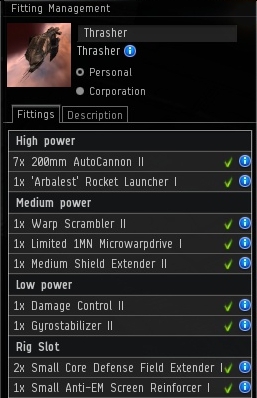 Write the PoS off as already dead, and have the expensive gear in capital ships/industrials. When, not if, WHEN you get attacked by a superior force move to a deep safe you’ve created before deep safes were nerfed(before May 18), and/or make a safe in system and logoff in it. Then, scan your static, which, since you’ve been preparing for this exact situation for a while, goes to a C4 or higher WH and will close exactly after you pass your entire operation through it, once it’s been shoved into cap ships/orcas. If said static has a static C4 or higher, move in, setup the backup pos and either rebuild there or go through the next static. The third method, that dedicated people of eve will probably do, and do better than me, is to want the hole more. Have an Orca/carrier cloak in system w/ lots of SB hulls, scan ships hulls, and fits. Get 5-10 people in. Proceed to activate every site after downtime, bomb the static periodically and generally make whoever tried to take your hole/lives in the hole you want wish they’d never heard of a local-lacking environment. Take 200 combat scan probes, launch seven, cloak. Repeat every 2 hours or so. Eventually, they will leave. Wait a week. If they come back, do it all again, if they don’t, setup a small pos and put a maint array/hangar in it. Have one big ship and one small ship for each pilot. Pilots logoff in big ships w/ scan ships/SBs in orca and CHEAP haulers/other ships in the small tower’s maint array. Don’t bother putting anything in the small tower’s corp hangar, as anyone who finds it will try to put it into reinforced, making removal of the stuff difficult. Don’t worry about defenses, again, if someone wants the tower dead, it’s dead. Make sure to have stront, and if the dudes come back lookin for trouble, unanchor the pos (using a cheap hauler w/ SB support), stuff it in the Orca and go back to step one. Repeat as necessary until they stop coming back and you feel safe enough to anchor a large pos and/or keep living out of orcas/capitals. Use any spare orcas/carriers to collapse the static at inoppertune times, and restock your equipment (using cheap haulers) at 5 am their time and/or downtime. Bubble the static and cloak SBs nearby. People attack your wormhole because they’ve either been hired to do it, they want your sites, or they’re just bored. The bored will leave, the hired will eventually stop working for the hirer, and the people that want your sites won’t get your sites because you activated all the sites every downtime. An Orca, a few scan ships and SBs w/ fits is not expensive at all compared to WH sites, so you can make their lives irritating w/ very little expense on your end. The person who wins will eventually either be the person/people who get bored first. Or, someone runs out of money. Who’s gonna run out of money first, the people w/ covops cloaks or the people who can’t cloak while they fight sleepers or mine? [TIP] In addition to Empire, Dotlan also tracks statistics for WH systems. You can track historical jumps and kills out of game in the following URL format: http://evemaps.dotlan.net/system/Jxxxxxx. So for example, you can see the history on this little C1. We’ve had a quiet weekend in our WH space as far as mining goes but saw a lot of visitor activity, especially Russian visitor activity. Found a good route to empire, C6 (us) -> C5 -> C4 -> highsec one jump from Jita. At this point I decided to start harvesting gas. I fitted a Dominix to take on Sleeper frigates and headed out to activate two Ladar sites. After a few minutes, a Tengu, Drake, and Scorpion were scramming me. They had apparently already scanned our system down and bookmarked it. When I came online, they came in for the kill. Now I do check the Dotlan charts for my system when I log on for the day, and I should have been aware that there were multiple jumps over the span of 3-4 hours prior to me logging on, but I ignored all that. Luckily I was quick with the mouse and got my pod back to the POS. After a few minutes of silence, I saw local blinking. ﻿[ 2010.03.13 14:27:36 ] Janychar > do u senk that we coold to destroy u pos? Hmm, I’m not one for smacktalk so I did not respond and starting onlining guns and POS shield hardeners. I think they were looking for me to respond because they eventually got bored and left our system. There were 10 hours left on our static WH and I sat cloaked watching numerous Space Patrol Russian Federation ships take a peek into our WH to see if any more targets were active until it eventually closed. They don’t make em like they used to. Sometimes, you go into a situation and you know exactly what you’re doing. Don’t let the fact that I myself have never found myself in that scenario from the offset deter you, you’ll eventually find yourself warping into a fleet fight knowing exactly who to primary, why to do it and which board game to pull out once the lag hits. More often, tho, you’ll enter a scenario that you honestly have no idea how to operate in. This will usually be made painfully obvious when someone who DOES know EXACTLY what the hell they’re doing comes along and tears you to pieces, possibly throwing a free trip back to empire in the process. Smart people learn from this process. Idiots complain. I’d like to talk about one certain idiot given his explosive comupperance, and for the first time on this blog, it isn’t me. Also for the first time, I wasn’t involved at all except for offering assistance and cheering from the sidelines. When suddenly my perfect rendition of Dragonforce is interrupted by people wanting to talk. ﻿[ 2010.03.01 15:12:02 ] Indiego Montoya > omg wai so srs. ﻿[ 2010.03.01 15:12:15 ] Indiego Montoya > wht is ur srz bzns? ﻿[ 2010.03.01 15:13:49 ] Indiego Montoya > well, crap on a stick. ﻿[ 2010.03.01 15:13:56 ] Indiego Montoya > that’s not good. Yes, apparently a serious-sounding alliance had found Damark, a dude who lives in a C3 w/ static highsec and laughs at most of my jokes. 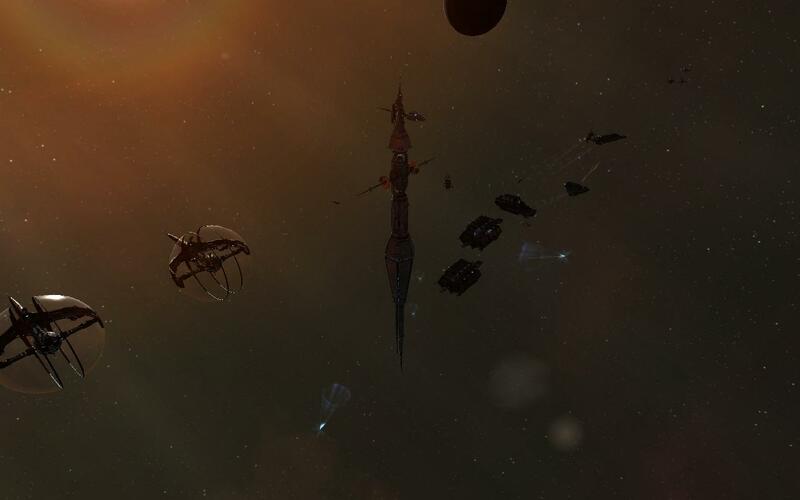 Damark came online to his corp’s small tower in reinforced, his true sansha large and other large untouched, and a caldari large not owned by him online in his system, owned by SRS business, some sort of alliance none of us had ever heard of, because we stopped caring about normal space a few months after each of us got into a WH. 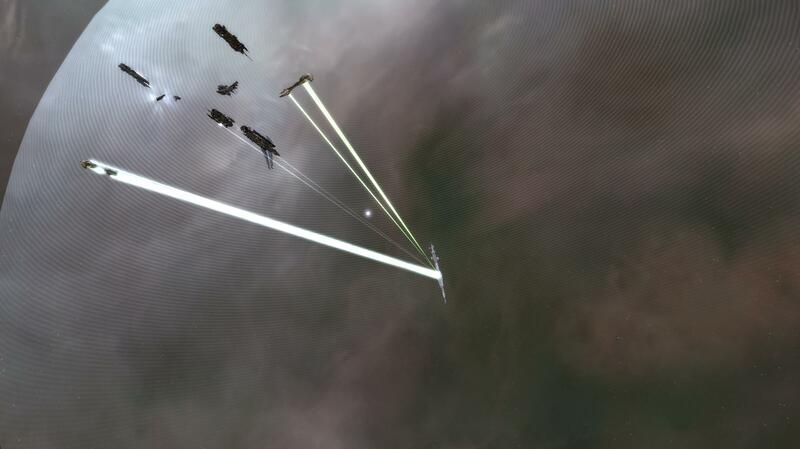 As per the non-agression pact we have, me and several other corps started informing corp mates, pressing Damark for info and offering ships, isk to hire Noir and gun modules. It was at about this point that Damark announced that the dude operating the pos had anchored moon mining arrays. He anchored moon mining arrays. Moon mining arrays. In a area of space where, to keep nullsec alliances from gaining intrest and other stupid reasons, moon mining is impossible. This was, we had thought, fairly common knowledge. It gets better. With that one statement, most of us went from talking to merc corps, panicky trying to get Noir(for all your overwhelming force needs!) on the horn, friends in high paces, friends in null places about any assistance they could offer to informing their friends that the dude had just anchored moon mining arrays and having a good laugh. The dude then anchored cruise missile batteries. The laughter continued. For the uninformed, cruise missile batteries provide dps on about cruiser level, are the only gun to stop firing once the pos goes into reinforced and can be speed tanked extremely effectively. He then anchored hardeners, one of each, the first REASONABLE move to make all morning. Damark started checking the fitting on one of his BSs, an armageddon. After a few minutes, where the BS was clearly visible on the directional scanner, he offlines an EM hardener and onlines a second kinetic hardener. This sounds reasonable, until you know that towers have an inherent 25% resist to kinetic, and amarr ships deal EM/thermal. ﻿[ 2010.03.01 16:47:12 ] Bizmarcks > did you finally realise you cant moon mine in here ? Prompting more laughter, as the one thing WHers can’t stand, besides russians(most of them, can’t speak for everyone) is idiots. But the one thing above that, that will enrage a WH dweller to the point of scorched earth strategy, is when someone starts acting smug and claiming your home as his own. The second reason that we apologized to our individual friends and that there wasn’t any threat that needed dealing with is that Damark is one of those peculiar paranoid people(90% of eve) that builds carriers in places that mass limitations on WHs forbid carriers from entering. ﻿[ 2010.03.02 06:16:44 ] Damark > lol those were mercs? See previous comments about smug idiots. More bashing. Damark gets convo’ed by the alliance leader. ﻿[ 2010.03.02 03:58:18 ] thebarry > so i’m carebearing in high sec, right? ﻿[ 2010.03.02 03:58:40 ] Damark > saying a POS is under attack? ﻿[ 2010.03.02 03:58:48 ] thebarry > yes! The CEO offers to remove the dude, and Damark requests 400 mil to let him leave peacefully, fully intending to steal the tower. SRS makes the first smart move all day and respectfully declined. Then make another stupid move. ﻿[ 2010.03.02 04:03:02 ] thebarry > are you guyz interested in joining a new alliance? What the hell are they smoking and can I have some? An agreement is made and instantly collapses. ﻿[ 2010.03.02 04:15:12 ] Damark > lol so your saying it has no stront now? For the record, it had one hour of strontium. ﻿[ 2010.03.02 04:35:49 ] thebarry > for? ﻿[ 2010.03.02 04:36:53 ] thebarry > just htink, if you were in a alliance you wouldnt have lost the small pos! You think I’m kidding? Whatever they’re smoking. I wanna have no intelligence whatsoever for the next few hours. The alliance lead pulls the dude into the private chat. ﻿[ 2010.03.02 06:29:52 ] thebarry > don’t you understand? ﻿[ 2010.03.02 06:30:48 ] Damark > by shitting on my lawn? The CEO apologizes for blowing up the small tower, and offers another incentive to join his alliance. ﻿[ 2010.03.02 06:39:21 ] thebarry > what did you lose? Is this standard alliance policy? Try to beat the crap out of someone, fail, and try to invite them into your alliance? ﻿[ 2010.03.02 07:09:27 ] Damark > save me from what? For the record, the two large poses were anchored less than five AU from where he put up his moon mining caldari large. Ten boring hours later, it explodes, Rigby Jess and Daedalic omitted cause they passed out a few hours earlier. tldr, carrier n friends stomp a WH pos into the ground after failed takeover. Hauling 360 mil worth of fullerides 25j: annoying and slow. Hauling 360 mil of fullerides in an itty V: stupid as hell. 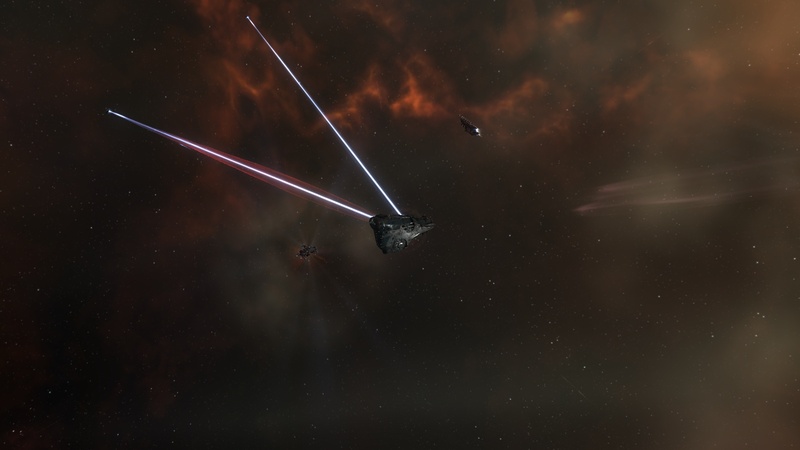 Cloak/AB warping on gates where you see BSs w/ sensor boosters: Sensible. Getting ganked on the jita gate after 25 jumps of cloak/AB: ironic. Maintaining a positive outlook just to screw with ganker’s head: Priceless. [03:04:44] Indiego Montoya > OFC? [03:05:15] Indiego Montoya > ah. [03:05:29] Indiego Montoya > no thanks. [03:05:45] Indiego Montoya > 360 mil. [03:06:48] Indiego Montoya > but can i ask you for 10%? [03:06:58] Indiego Montoya > so i can afford to keep flying haulers w/ 360 mil in them? [03:09:23] Indiego Montoya > that was about a weeks pay for me. [03:09:43] Indiego Montoya > so i’m honestly finding it hard to sympathize. [03:11:04] Indiego Montoya > highsec ganking? [03:11:29] Indiego Montoya > highsec ganking…several people? [03:11:47] Indiego Montoya > damn. [03:11:52] Indiego Montoya > i was sure that was it. [03:12:23] Indiego Montoya > mmhmm. [03:12:31] Indiego Montoya > ooo, you stopped talking in all caps. [03:13:46] Indiego Montoya > woohoo! [03:13:51] Indiego Montoya > you missed three cans! [03:13:57] Indiego Montoya > 76 mil, baby! [03:14:03] Indiego Montoya > i can rebuy everything with this! [03:14:57] Indiego Montoya > man, awesome, 76 mil on the gate. [03:15:44] Indiego Montoya > thats 4 more than i asked for! [03:15:48] Indiego Montoya > you’re awesome. [03:16:12] Indiego Montoya > ooh! and fullerides are up 50 isk! [03:16:18] Indiego Montoya > best day ever! [03:16:57] Indiego Montoya > so? [03:16:59] Indiego Montoya > dude? [03:17:05] Indiego Montoya > i just made 76 mil in 5 minutes. [03:17:13] Indiego Montoya > nothing can top that. [03:17:47] Indiego Montoya > but mining, gettin 200 mil takes hours. [03:18:10] Indiego Montoya > i’m gonna look for more of my corpses! [03:18:19] Indiego Montoya > thanks again dude, i gotta fly. [03:18:53] Indiego Montoya > whats a mong? [03:18:56] Indiego Montoya > mongolian? [03:18:59] Indiego Montoya > those dudes are awesome. [03:19:15] Indiego Montoya > you’re a mongolian too. [03:19:22] Indiego Montoya > let’s get some elephants. [03:19:29] Indiego Montoya > wait, no, that’s huns. P.S., The corp of the ganker apologized profusely and booted the ganker out of corp, apparently karma does exist. He made 300 mil off a successful risk and got booted out of a corp he joined yesterday which he probably didn’t plan to stay in. [05:52:08] Indiego Montoya > if you apologize one more time i’m sending your CEO a letter saying that you were involved in it.